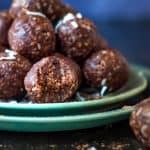 These Cacao Bliss Balls take just minutes to make, contain just 6 ingredients, are free from refined sugars and are perfect for on the go snacks, your work lunchbox, and after dinner munchies. 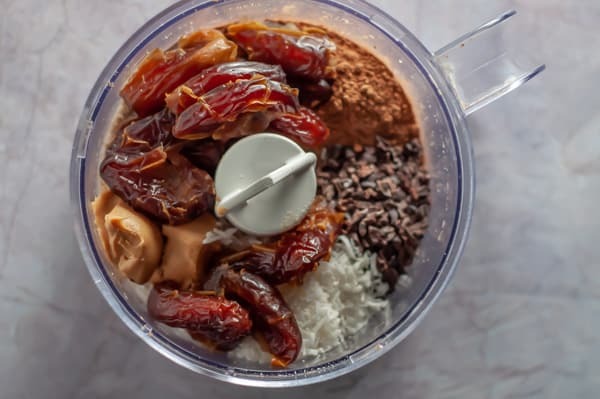 Grab your six ingredients, soak the dates to soften them up, and add everything into your blender or food processor and blitz until a sticky (not wet) crumb is formed. Roll ‘em into balls. I prefer gold ball size as I find it just right for snacks. 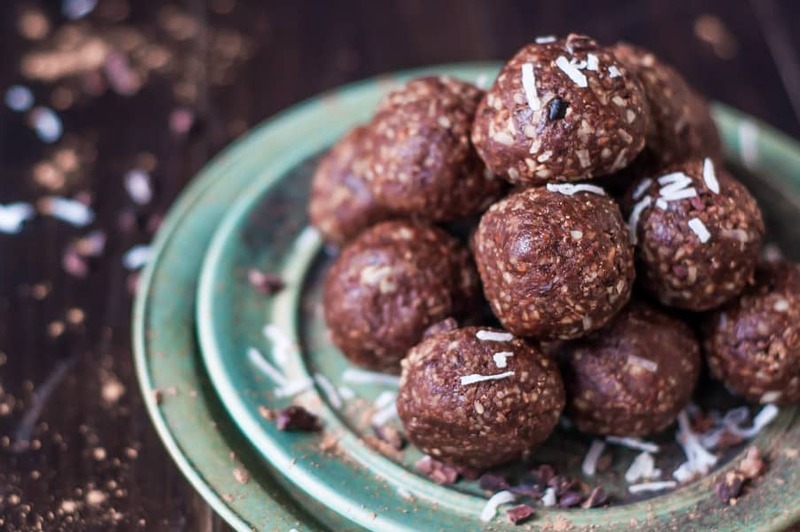 These Cocao Bliss Balls won’t need any extra moisture to bind the ingredients. The dates and peanut butter are enough. Just make sure to soften the dates in boiling water before hand to soften them up and get their moisture back. 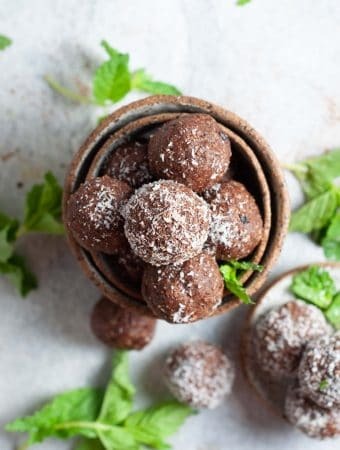 Basically these are delicious Chocolate Bliss Balls which are not only super good for you, they are also low calorie, low fat and low carb. 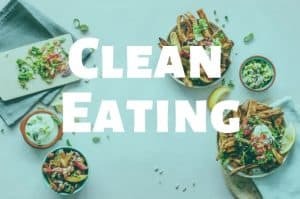 Each serving comes in at 117 calories each. 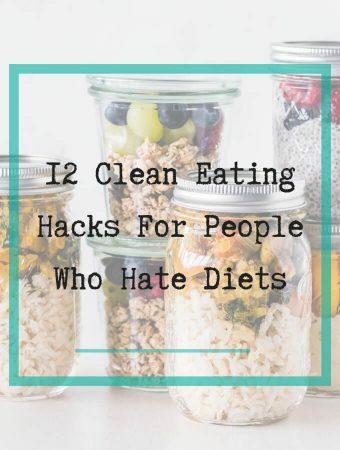 The are so simple to make and are the perfect for clean eating snacks during the day, at work, or before a workout. 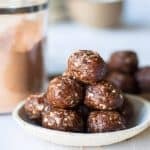 These chocolate bliss balls are sweet but not too sweet with a nutty texture and smooth date, cocao and peanut putter and almonds that come together to form the perfect sized super food to enjoy….well anywhere really. 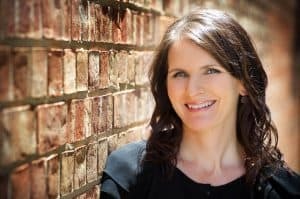 PRO TIP: For perfect cacao bliss balls, use damp (not wet) hands to avoid the mixture sticking and lumping on your hands. You might need to clean and wash, then lightly dampen your hands a couple of times to get clean round balls. 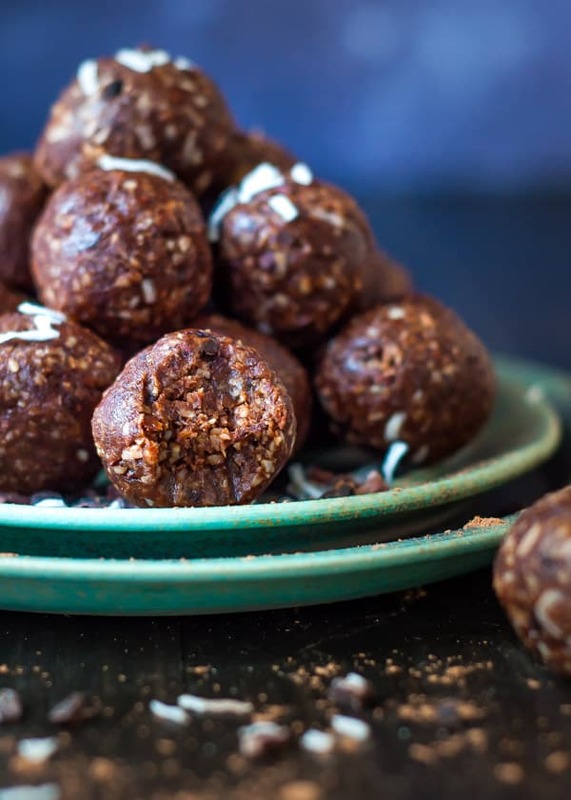 To load up on these treats for the week, all you need is some unsweetened coconut, medjool dates, almonds, natural peanut butter, cocao nibs and cocoa power. Medjool dates are ideal for this recipe because they are bigger, juicer and sweeter than regular dates. Cacao powder is similar to Cocao (chocolate) powder but is less processed and is sourced from the Cocao tree. 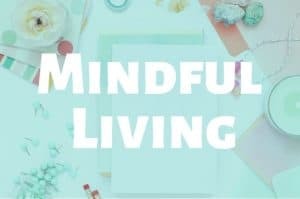 I have seen Cacao powder in mainstream supermarkets and of course you can also get it from Health Food stores. 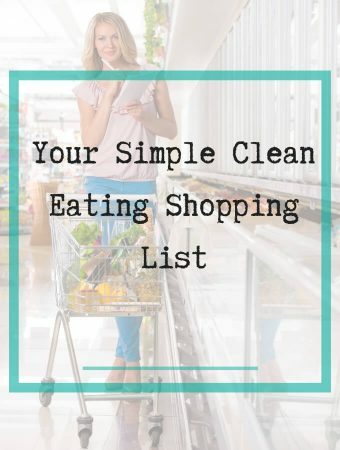 You can substitute with Unsweetened Cocoa powder if you don’t have Cacao powder, but using Cacao definitely increase the health aspect of these yummy clean eating snacks. Cocao Nibs come from the same place as Cocao powder. The powder are the nibs ground down. 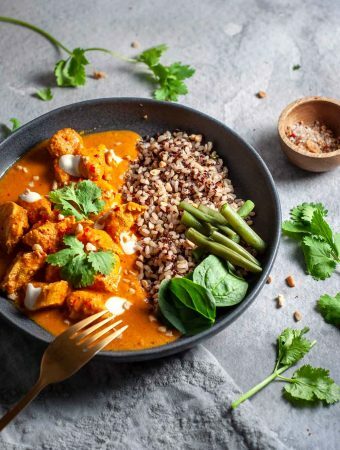 They might taste a little bitter on their own, but when added to a recipe make for nice texture and flavour. You might of noticed that I am quite the fan of bliss balls. 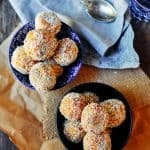 I have made quite a few, including these apricot bliss balls, date free bliss balls, mango protein balls, and these sugar free bliss balls. 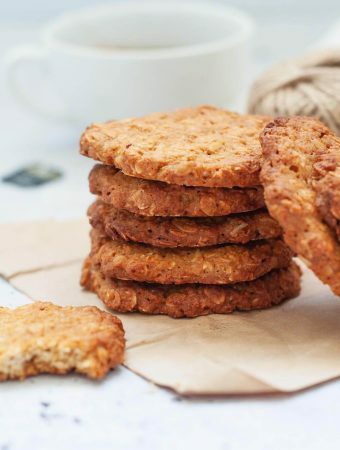 Pair these with your morning coffee at work for a healthy and filling snack to tide you over until lunch. Pop one if you feel the 3pm munchies coming on. In the “in between time” where you’re on your way home from work and on your way to the gym. 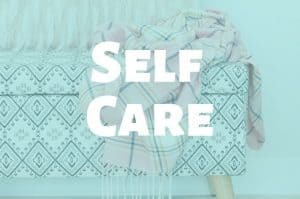 Its a great little energy boost that won’t weigh you down. 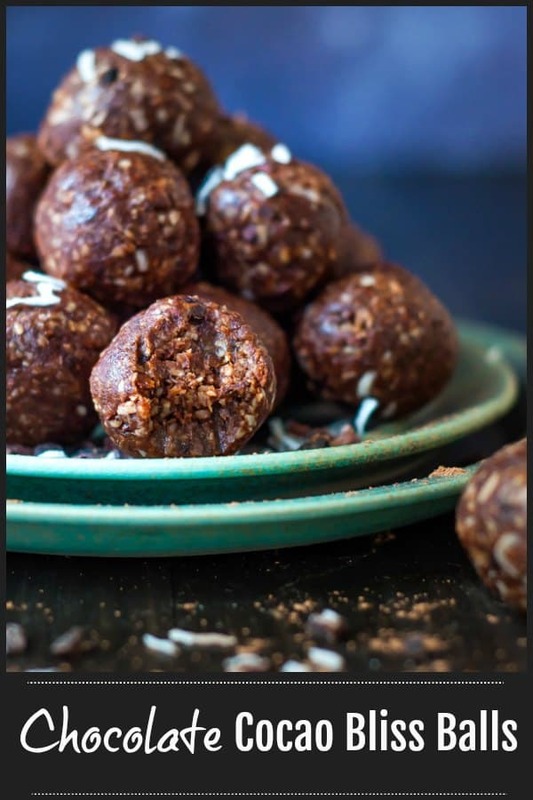 Stop the hangries before they happen with a trusty little Cacao Bliss Ball. After dinner when you “suddenly” realise you have a craving for something sweet. This little number will hit the spot and not send you over the edge with a sugar high. 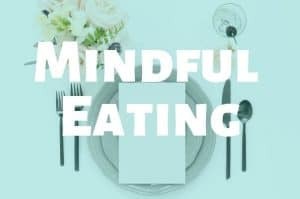 To make sure your Cacao Bliss Balls stay as fresh as possible, it’s ideal to store them in a good quality BPA free plastic air tight container. 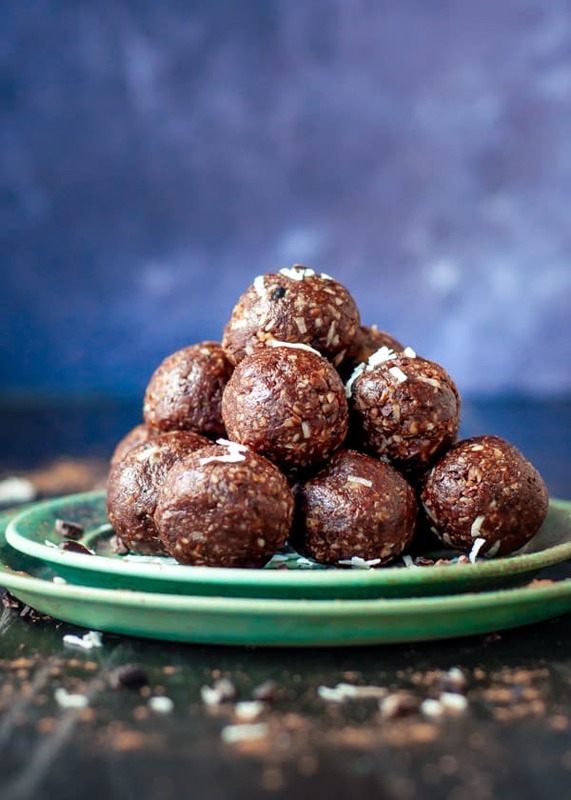 BONUS TIP: Chocolate Bliss Balls also freeze well. 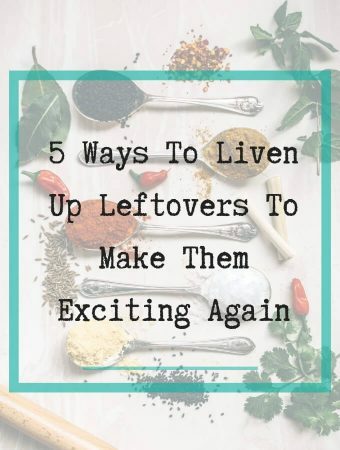 Just pop them into a suitably sized freezer container, and they will keep for upto 4 weeks. When you want to eat them, let them come to room temperature first. 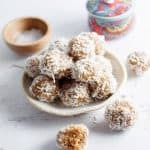 If you have a spare 10 minutes this weekend and you’re looking for a healthy snack for work lunchboxes, or to have something on hand for those after dinner sweet cravings, this is the one to make. 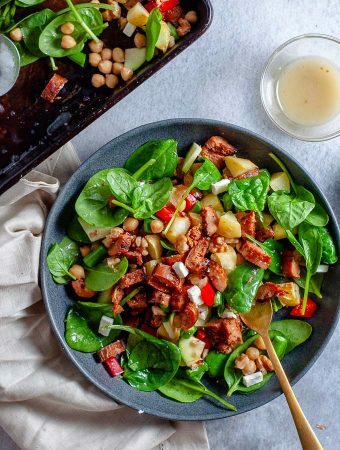 Super easy, very tasty, without all the unnecessary processed elements. 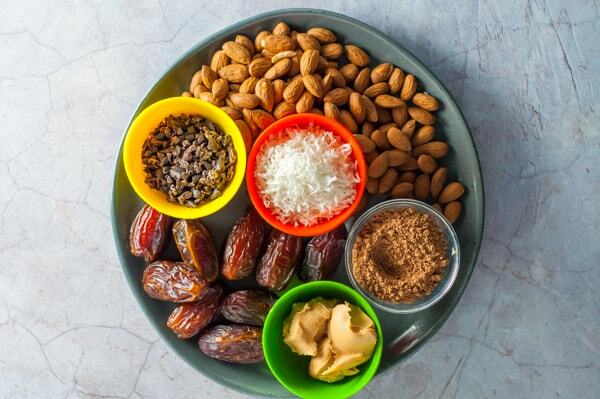 To soften dates, place deseeded dates into a bowl of boiling water for 5 minutes. Drain the dates and set aside. 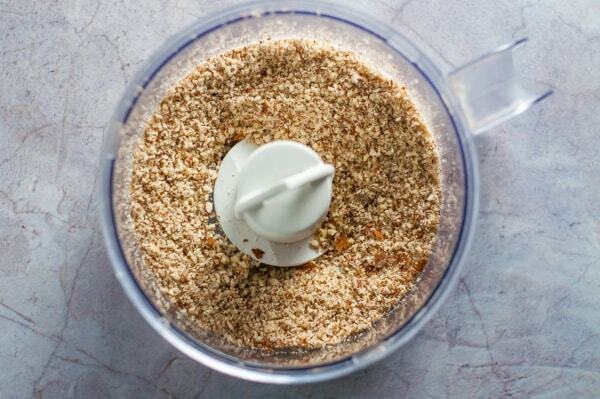 Add the almonds to a food processor and blitz until they resemble a crumb. 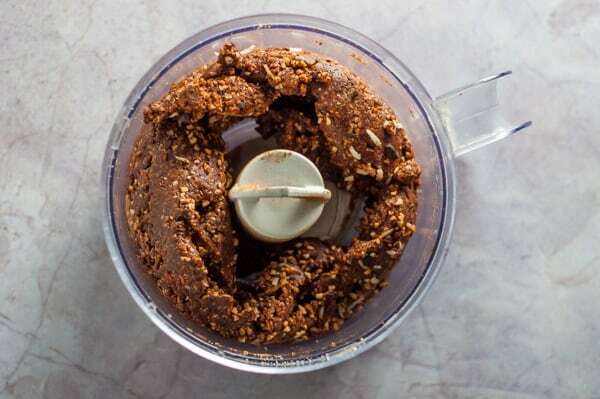 To the food processor, add the coconut, cocao nibs, cocoa powder, peanut butter and softened dates. Blitz the ingredients for 1 to 2 minutes until the mixture comes together. Take the blade out of the food processor and roll the mix into 16 balls. 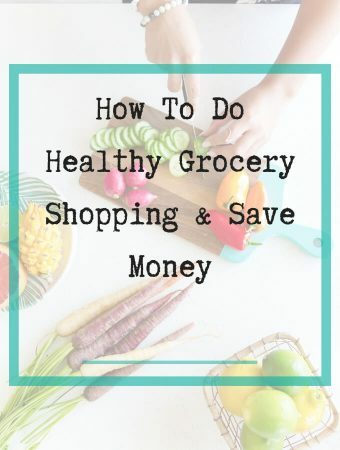 Store in an air tight container in the fridge for upto 5 days.